The admin page is used to customize the device settings and manage the device password. Establish a Wi-Fi network connection with a device (eg., computer, smartphone, tablet, etc.). Network credentials (SSID/password) are located on the back of the MiFi. The password is the IMEI minus the last digit. 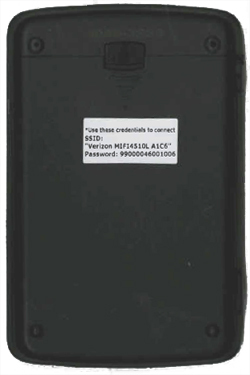 The Wi-Fi / Admin password is on a label located on the back of the device or on a label located under the battery. 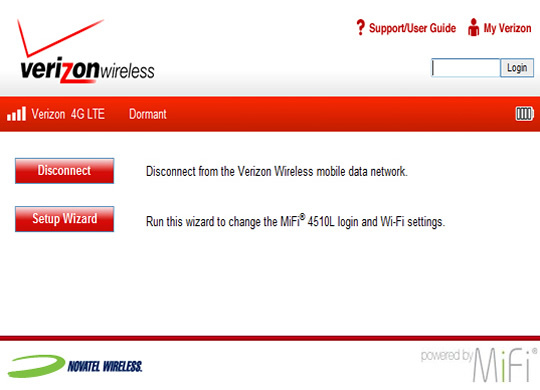 The password is unchanged by the DUU, i.e., customer set password or the IMEI minus the last digit. If the password is unknown perform a hard reset using the alternate method then use the IMEI minus the last digit. Launch a web browser, type 192.168.1.1 into the URL address field then press Enter. If the admin page does not appear, refer to step 1. Enter the password then select Login (located in the upper-right). The password is unchanged by the DUU, i.e., customer set password or admin. If the password is unknown perform a hard reset using the alternate method then use admin.